The beginning of your child’s senior year of high school can be a difficult period of time. You have given her lots of room to explore her college options, but it’s time to get realistic about cost. What you want to avoid is the heartbreaking scene of your child learning on April 1 that she has just been admitted to the college of her dreams, and you learning moments later that its price is completely out of reach. So, if you haven’t begun the dreaded family conversation about what you can afford to pay for college, the time is now. 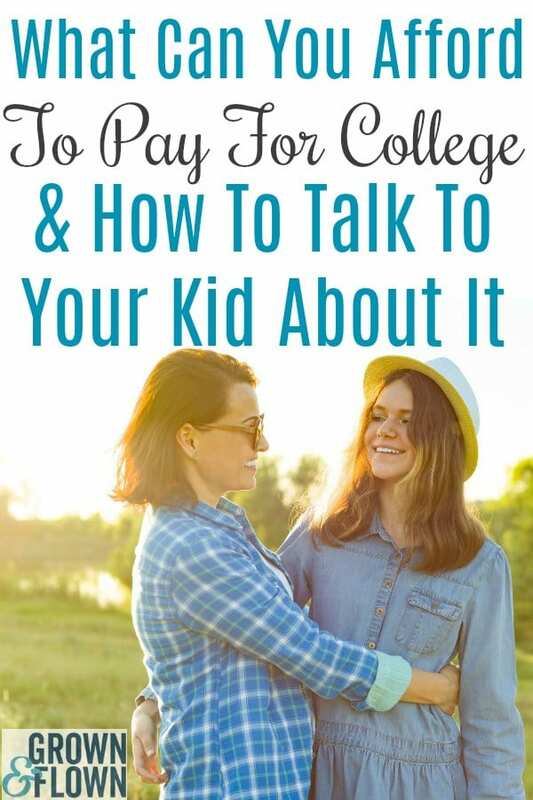 But before you can sit down to talk, before you can know which colleges will be affordable and which will not, you will need to create a budget to learn what you are able to pay. And just as important, what you are willing to pay. This is no time for wishful thinking or magical realism. How much can I contribute monthly towards my child’s college education? You have many non-discretionary expenses: mortgage or rent, car payments, insurance, groceries, healthcare costs, retirement contributions, etc. Add these up. Then, add up your discretionary expenses: restaurants, entertainment, travel, gifts, etc. Add the two figures together, and subtract it from your after-tax monthly income. Hopefully, there’s a surplus. Add to this sum the amount you can contribute from savings each month, and you have arrived at a figure available for college costs. Paying for college usually requires tightening the family belt, so if you can reduce your discretionary costs, that will help. College will be very expensive, but what you can contribute must be a number you can reach every month for nine consecutive months. Suppose after creating your budget you learn that you can contribute $20,000 a year towards your child’s college cost. How big a financial aid package will she require? If her dream school has a total cost of attendance (COA) of $70,000, then she will need a financial aid award of $50,000. But it’s important that you, and your child, understand long before it arrives in the mail what that package will look like. Federal student loans are typically the first dollars to be packaged because it is government money, not the institution’s. A few highly selective schools with large endowments have replaced loans with institutional grants, but most can’t afford to do this. For a first-year student, this portion of the award will likely be $5,500, the federal first-year cap. For second-year students, $6,500. For third- and fourth-year students, $7,500. This equals $27,000, the likely amount of loans that will be packaged in your child’s financial aid awards over four years. Monthly repayments begin six months after graduation. The offer of campus employment is the second source of dollars in the financial aid award. It is a commitment by the institution that the student will find an on-campus position reserved for recipients of financial aid. These jobs in the library, at the coffee shop, or in the admission office typically pay between $11 and $13 an hour, and the student would receive a weekly or biweekly paycheck to be spent however the family sees fit. A reasonable estimate of total earnings for an on-campus job of 8-10 hours per week is about $2,500. The third part of the financial aid award is institutional grants and scholarships. Free money that does not have to be repaid. 1. How much can you afford to pay each month, and how much are you, the parents, prepared to take on in additional debt? Many parents are reluctant to discuss money matters in front of their children. College is an investment in her future, and she should be in the conversation. 2. If your child is eligible for need-based aid, it is likely that her financial aid awards will include $27,000 in student loans over four years. Is this a reasonable amount of debt for your child to face after graduation? A useful rule of thumb on the size of educational debt: Do not borrow more than you expect to earn annually at your first job after college. And there is reason to believe that having skin in the game can be a good motivator of academic engagement. With low interest rates and fees, and with flexible repayment plans that protect the borrower against loss of job, illness, or injury, these are the first loans to take if needed. But is she aware that she will be taking on this debt? Is she aware that the loans are in her name, not yours? When repayment begins six months after graduation, who will make those payments, you or her? 3. Campus employment will likely be part of her financial aid award. Is she okay with a work commitment of 8-10 hours a week for 25 weeks of the school year? Are you? 4. Have you run the net price calculators for each of the schools currently on your child’s list? These are located on each college’s website. Though not perfect predictors of what the college will actually cost you, they are a guide. Are there enough affordable schools on her list? Is she willing to add more “financial safeties” if there aren’t? 5. Are there any additional ways your family can tighten the belt to increase your family contribution? Any other sources of funds? Will your child begin to look for outside scholarships? 6. Finally, is your child prepared to walk away from an acceptance to a school that will cost more than you can afford? Are you? As you see, this will be a tough conversation. But don’t focus exclusively on the financial hardships. Explore the enormous advantages that a college education bestows. It is the gateway to your child’s dreams and aspirations, and probably the most important investment your family will ever make. But it is also one of the most expensive. The cost of this investment needs to be understood, managed, and embraced by all of you. Want to learn more about how to pay for college, financial aid, and scholarships? Jeff is one of the 10 experts you can work with in Grown and Flown’s premium service, G&F Parents: College Admissions and Affordability. We provide a personalized service where experts, including Jeff, answer your family’s admissions and financial aid questions.